The Tilted World by Tom Franklin and Beth Ann Fennelly: Look! I can strike another one off my Backlist Reading Challenge! This one is the first off the WPL titles list too. I found it as an audiobook and that pleased me to no end. The narrator, Brian D’Arcy James, had a very assured voice, quite nice and well-suited for this story. He only had a teeny bit of cringe factor when he tried to do the female voices. There were not too many times when the female dialogue was spoken however, so the cringing was kept to a minimum. Tom Franklin’s debut, Crooked Letter, Crooked Letter was a wonderful read and one I found I could not put down, therefore I really was looking forward to reading The Titled World. To cut to the chase, it was fine, but no where near as wonderful as Crooked Letter, Crooked Letter. Brief Synopsis: Set against the backdrop of the historic 1927 Mississippi Flood, a story of murder and moonshine, sandbagging and saboteurs, dynamite and deluge-and a man and a woman who find unexpected love-from Tom Franklin, author of the bestselling Crooked Letter, Crooked Letter, and his wife, Pushcart Prize-winning poet Beth Ann Fennelly. 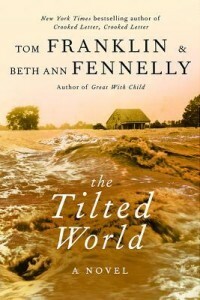 The Tilted World is about two men – partners – Ted Ingersoll and Ham Johnson, federal revenue agents tasked with finding out what happened to two other revenuers that have disappeared from Hob Nob, Mississippi while tracking a bootlegger; and one woman, Dixie Clay, married to said bootlegger. 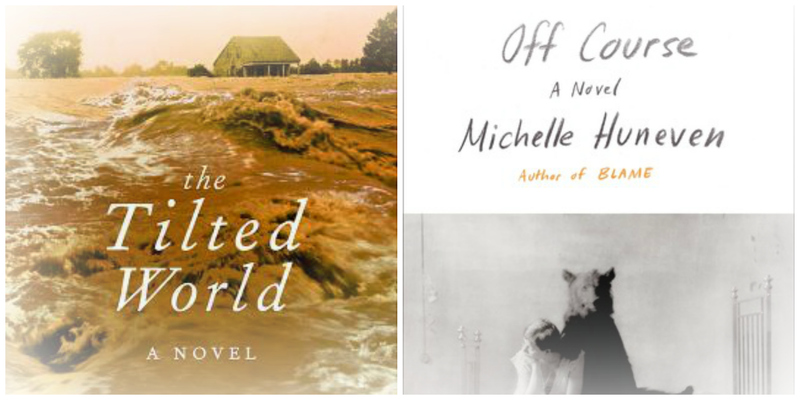 The backdrop to the story is the 1927 great Mississippi flood (there is some historical acknowledgement of this event and draws many parallels to Hurricane Katrina in the readiness of the government to assist the poorer and black people of the South). As the story develops, Ingersoll and Dixie Clay draw closer to one another even though their situation could provide for a dangerous and unlikely relationship. Adding to this is the deadly plot by some to dynamite the levee and flood Hobnob. As the story comes to a swell (;-) ) Ingersoll, Ham, and Dixie Clay must make desperate choices that will transform their lives, provided they live through this natural and man-made disaster. Overall, not a bad read, Franklin does have a wonderful way with his character development, and the narration was pretty solid and enjoyable overall, but there was nothing too memorable here that made this one sing or stand out for me. 3 stars. 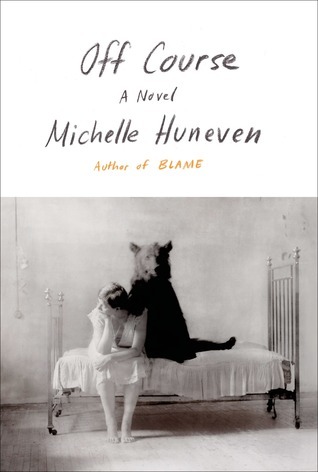 Off Course by Michelle Huneven: This was one I had significant difficulty getting behind and continued to become increasingly closed off from it, struggling to reach its end. Its ending also finishes in a great rush and tumble and was written as though Huneven herself couldn’t wait to rid herself from her protagonist Cressida. Cressida (Cress) is desperate to finish her dissertation, something she hasn’t started to write yet, and decides to hide out in the woods at her family’s cabin. This is the same cabin her parents bought when Cress and her sister were young girls and felt “forced” into staying each weekend of their summer vacations. They considered their time spent there with hostility and was used only as a way to keep them from enjoying time with their friends and behaving like and enjoying the things teenagers enjoy. Up here, she anticipates being left in quiet solitude to bang away at this dissertation. Instead, Cress spends the majority of her time banging away with the married men that live and work up there. First is Jakey, a man with a significant age difference from Cress and a guy that turns out to be the town’s Lothario. Next up is Quinn, a man that only pays lip service to the forever and undying commitment to his wife. Cress is unable to complete even an opening chapter such is all her time spent fornicating in the grass, in the cab of a truck, in other people’s cabins and beds… and then whining about the townsfolk’s cold shoulder treatment to her and her choices in bed partners. In the rush and tumble end, Cress finally submits -as described in her own words – a thin dissertation – one that she admits to her lover Quinn, she simply doesn’t care about any longer. She then also marries a man where, once again, comes with a noted and significant age difference (exhibiting some potential unresolved and ongoing Daddy issues?) but continues to think longingly of Quinn. The end. This book was described using one word to my fellow Hoarders: insipid (as lacking in taste). 2 stars. Sorry didn’t like this one.